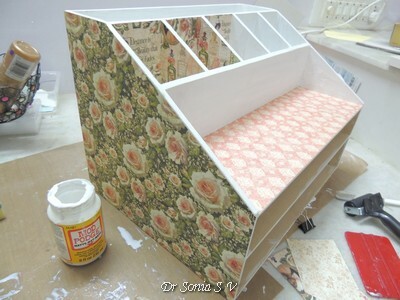 Hi friends...happy to share a special project I made for my craft-room ...a decoupaged desk organiser. 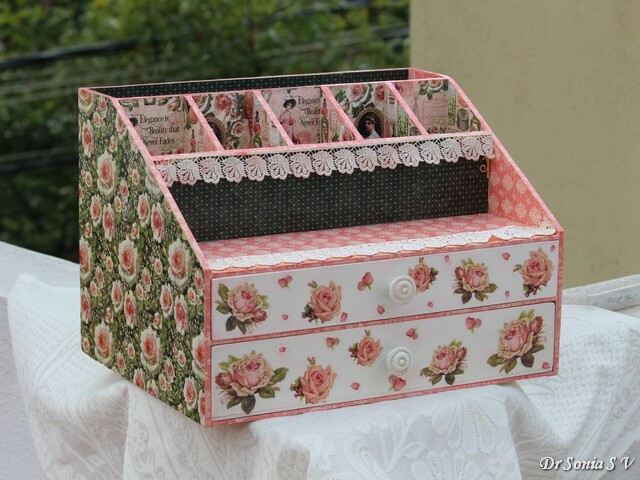 This is a mammoth desk organiser and has place to hold a lot of my crafty supplies but truth be told I just feel like looking at it and not using it at all...it turned out too pretty to use!!! This is the MDF organiser I got from TCES... 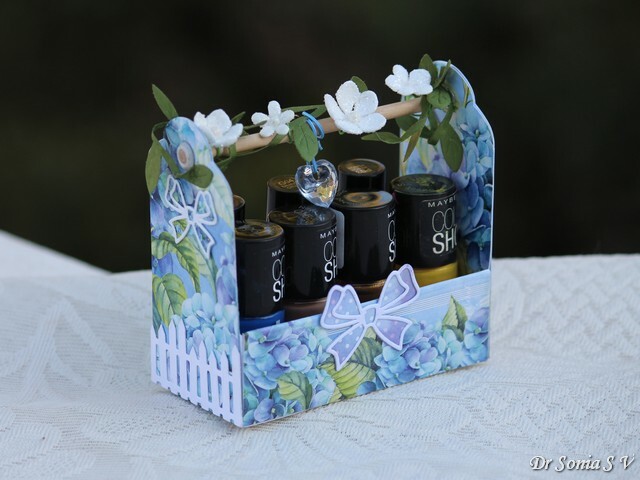 I love the quality of Rakhi's products and this is the 2nd one I got from her...you can see my first project here : Ocean Themed Shadowbox Desk Organizer. 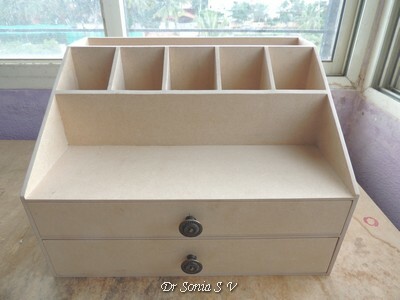 This organiser is pretty huge measuring 16 x 11 x 10 inches and made of thick sheets of MDF so it is pretty sturdy. 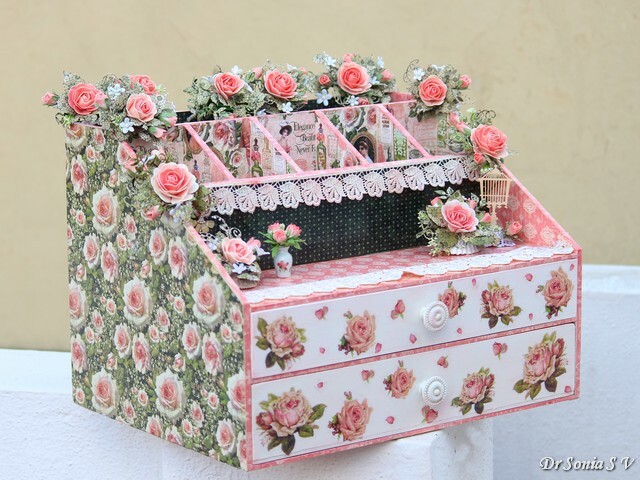 It was quite easy to decoupage too as it comes already smooth and well sanded thus saving a lot of time when decoupaging and it is easy to get a beautiful finish. 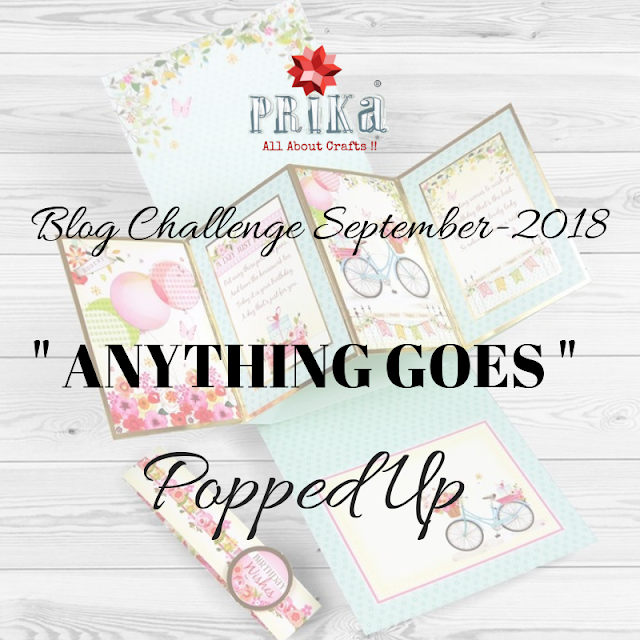 I chose to use Graphic 45 once again....somehow Graphic 45 papers are my go to papers for large projects and those really special ones and the themes are so fabulous and it is also easy to coordinate the papers! After a coat of gesso , decoupaged the organiser using Graphic 45 papers from 2 stacks : Portrait of a Lady and Portrait of a Lady Patterns and Solids. 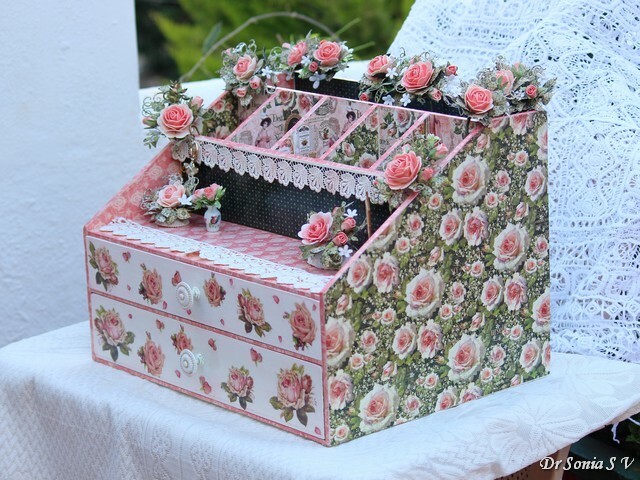 Used rice papers from Stamperia to add the lovely roses and petal on the draws. Though rice paper is expensive it is so much easier than decoupaging with napkins. 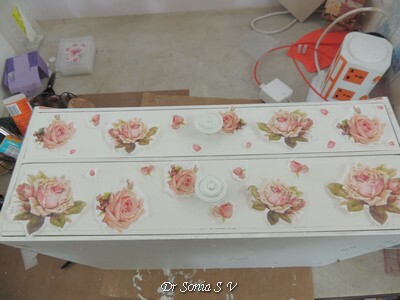 I used Folk Art paints and Distress Inks to change the white around the roses to a cream shade with a peach/pink tinge. 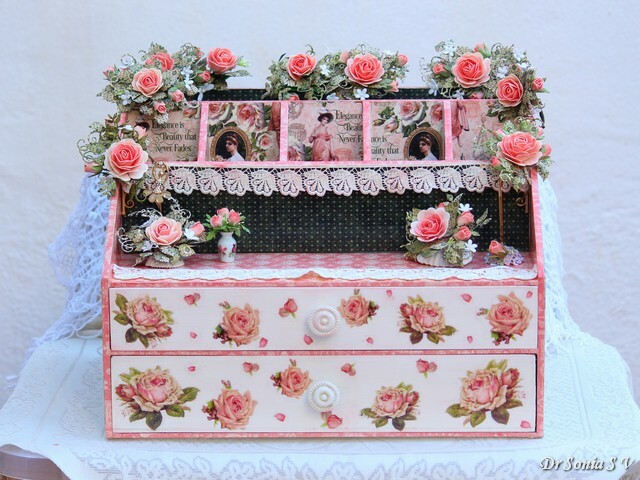 The above picture is how it looks without the roses and is actually pretty sober and functional but I just couldnt resist making matching foamiran roses and rosebuds with my new Graphic 45 flower dies. 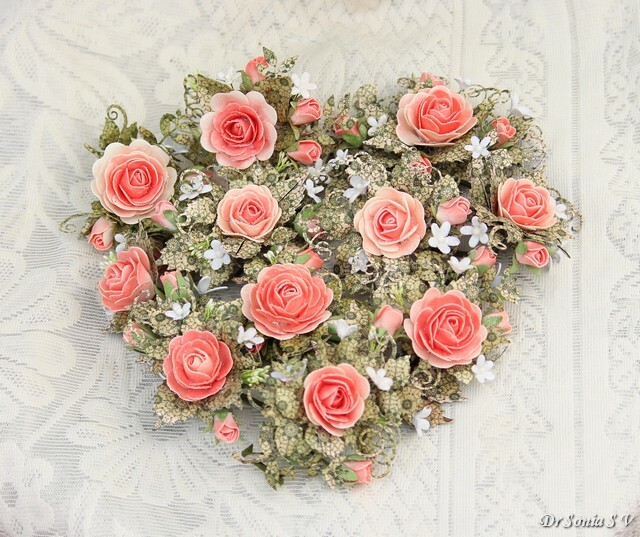 I used the large die to make the big roses and the medium one to make the rose buds...the shape was just perfect that I didnt have to even heat the foamiran ! To get the exact shade of peach to match the papers I used 2 colours of artists oil pastels to colour cream foamiran. 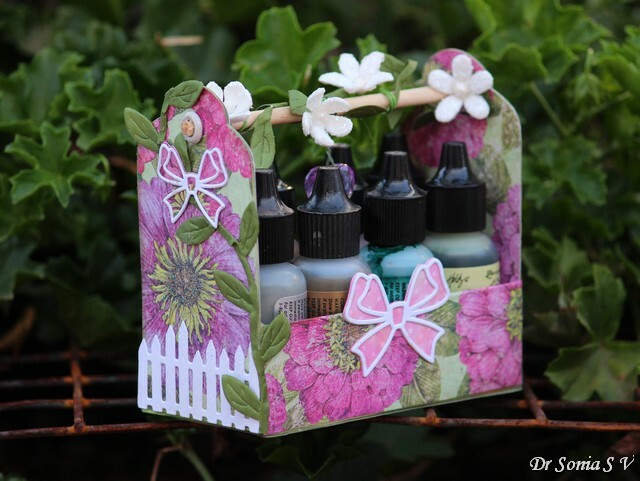 The foliage around the flowers was also made using Graphic 45 papers...I just inked it a bit using Shabby Shutters Distress Ink for a perfect match. The little white filler flowers were also made with foam but this time I did heat the flowers for a second or two to help shape them. 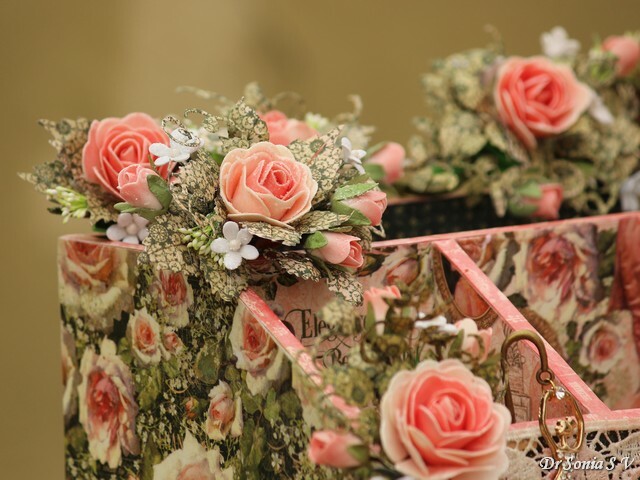 The roses were given a sprinkle of "sparkling dust" for a subtle shimmer! 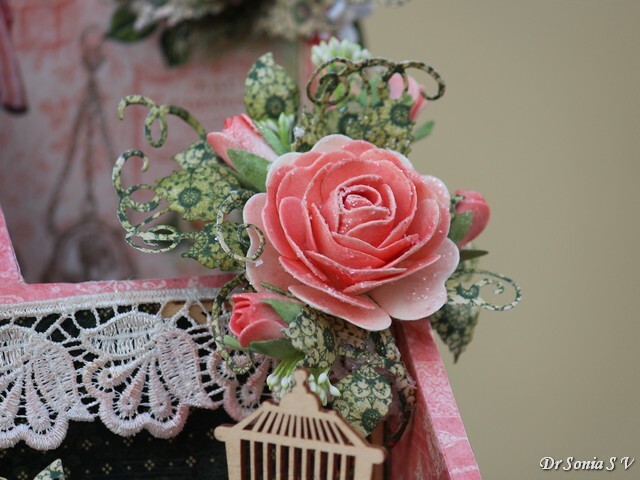 The little bird cage is a chipboard piece mounted on a clay base and dressed up with lace and a rosebud. 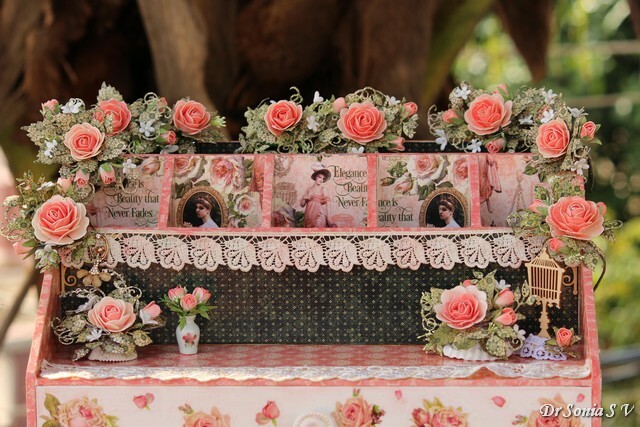 The images from the Graphic 45 "Portrait of a Lady" are so lovely I could stare at them all day! On the "shelf" two of the floral arrangements have roses and foliage attached to a shell so that I can move them away when I want. 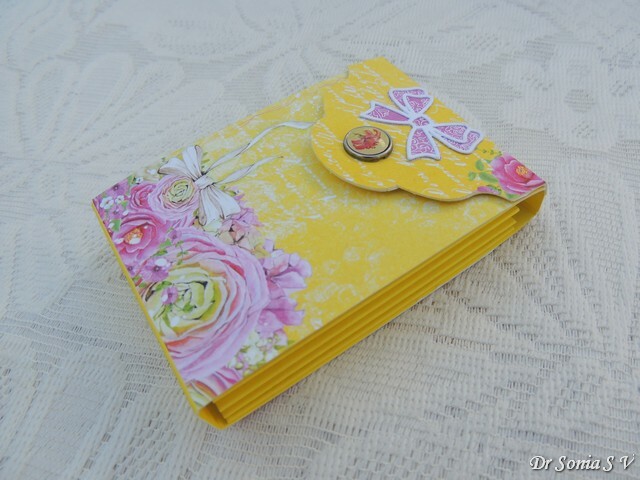 I am so glad I could use the beautiful rose pattern paper on the sides...I had been hoarding it for a special project. 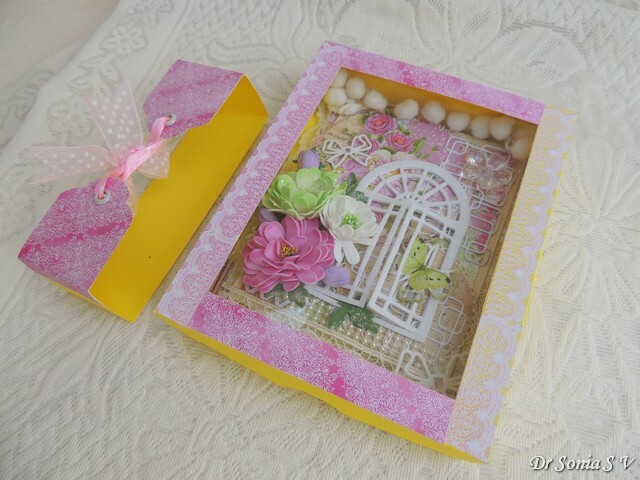 And here are all the foamiran flowers I used to decorate this desk organiser. I hope you liked my project . Papers : Portrait of a Lady and Portrait of a Lady Patterns and Solids. 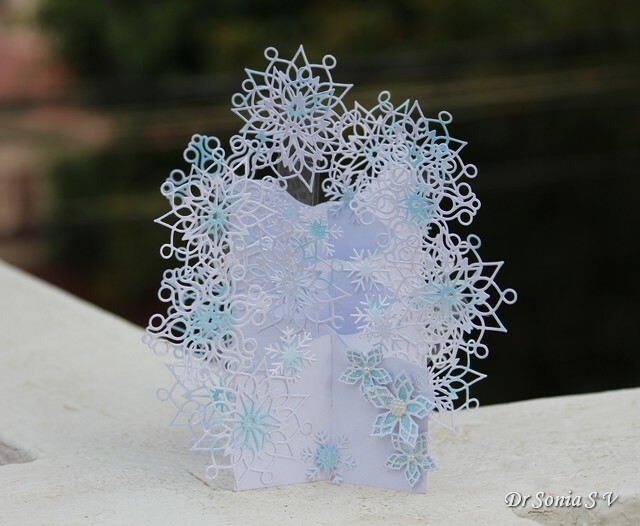 Hi friends sharing another Pop Up Card in a cascading design similar to the Snowflake Cascading card I had shared earlier. This time I modified the snowflakes by chopping off bits and added a snowglobe. 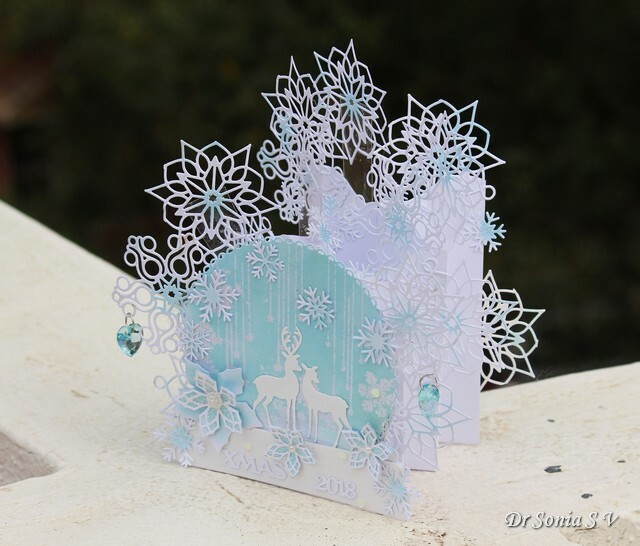 This special card is my DT project for the Rudolph Days Challenge . I created the design on the snowglobe die cut by stamping and heat embossing snowflakes and falling stars and inking with Distress Inks . 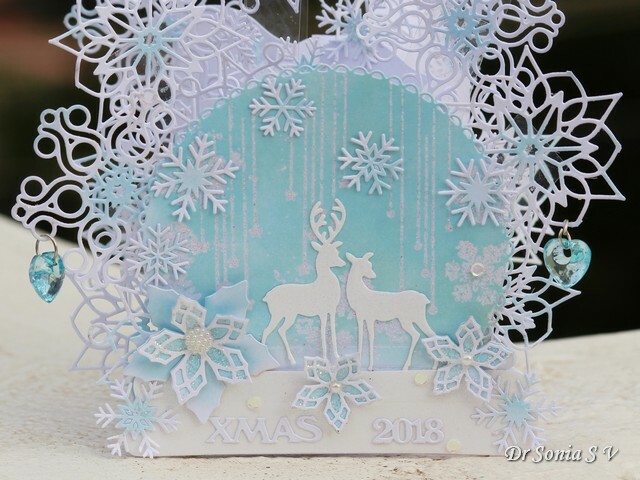 Added a pair of die cut deer and poinsettias and finished off by adding " XMAS 2018"
I am in love with the teal blue and the dangling hearts! 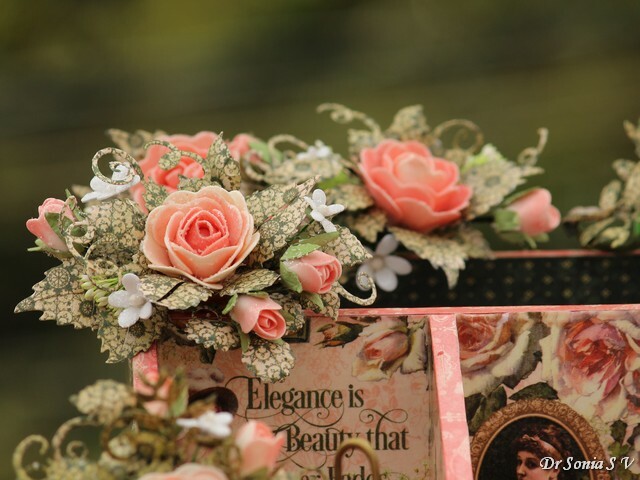 In the side view below you can see the cascade and the best thing about this card design is it folds flat for mailing! Dont forget to join us at the Rudolph Days Challenge....Maureen always has some fabulous prizes you can win. 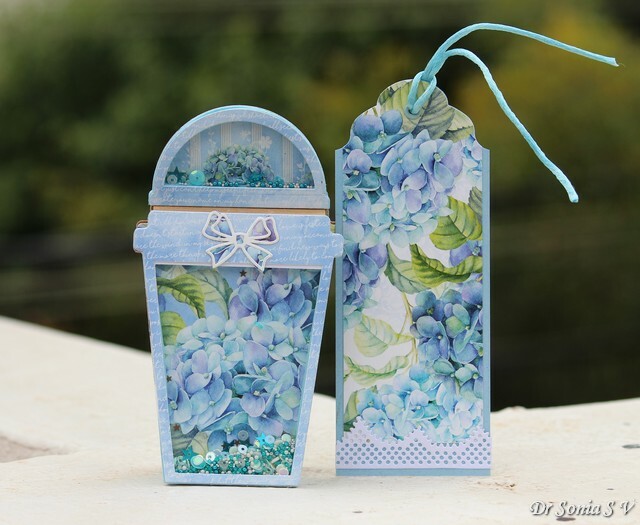 Hi friends...I am in love with the Snow-globe die from Crealies and just couldn't resist sharing another creation with it. 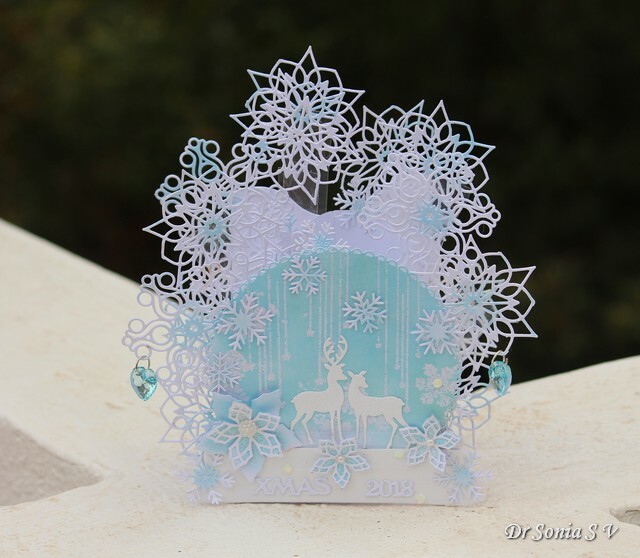 This card which can also be used as an ornament on your tree was made using 2 snowglobe die cuts. 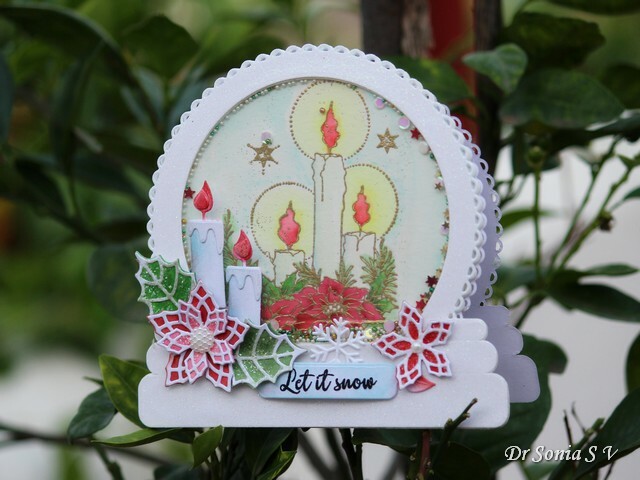 One one snowglobe I stamped and water-colored the Crealies candles and poinsettia image using Zig Watercolor Brush Pens . Diecut a snowglobe in double sided adhesive foam and diecut a window inside it. 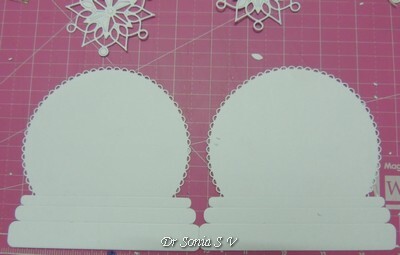 Chop off bits on the borders of the foam for easy placement. Place your shaker elements and stick on a acetate sheet. Top off with a snowglobe + window cut on glittery white card stock . I die cut some candles [also from Crealies] and added it behind the poinsettia so that there were similar elements both inside and outside the shaker! 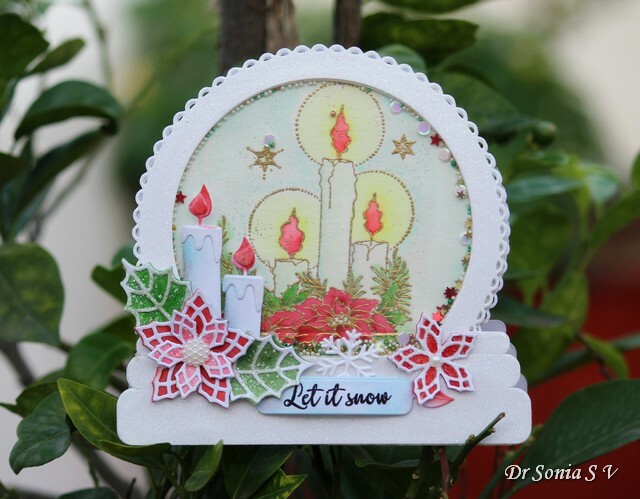 The let it snow is stamped on a candle. I hope you like my Snow globe card in traditional Christmas Colors. 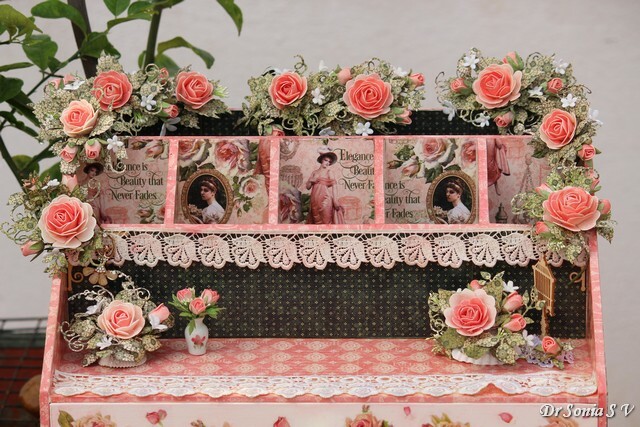 Hi friends...sharing a special 3 D Interactive Pop Up Card....in a Cascading design! 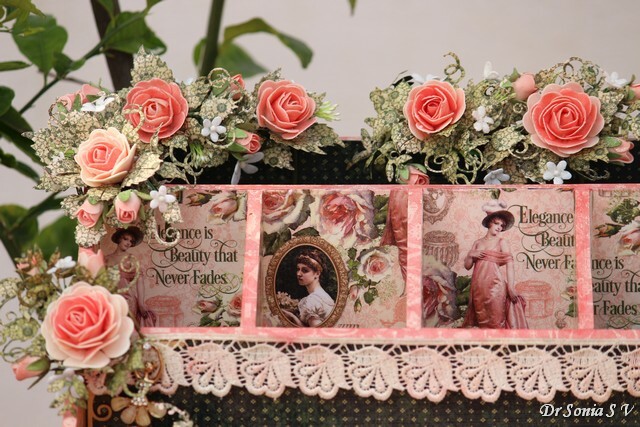 Cascading cards used to be very popular at one time and though they look very complicated they are actually wonderful cards to make when you want that to make an extra special card! The design is just a fusion between accordions and slots. 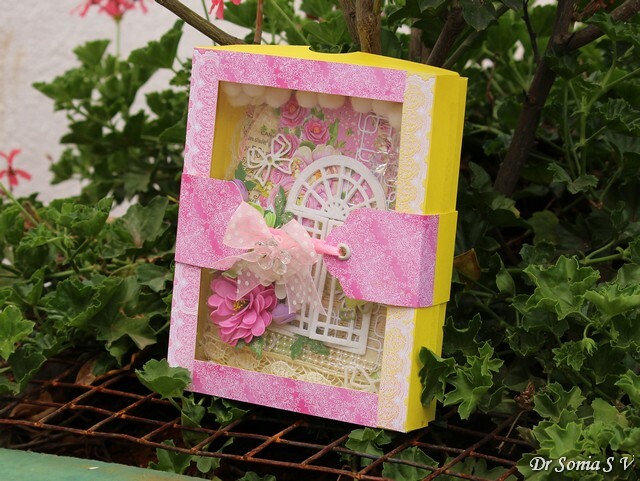 Here is the Tutorial link : Cascading Card Tutorial . 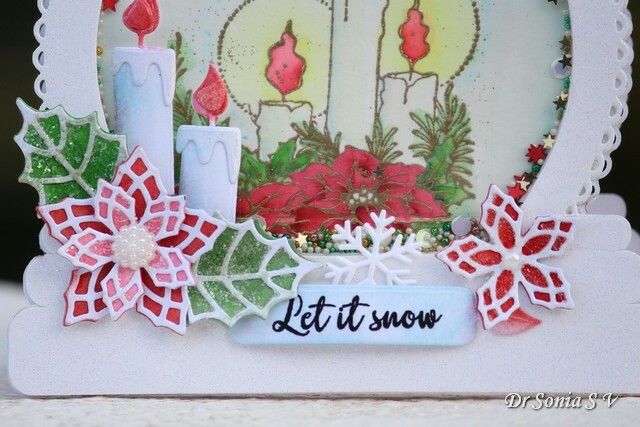 I made the base using my original Tutorial and then used the border die from Crealies Snowglobe set to cut a wavy border on the top part to create a snowy landscape for the snowflakes. 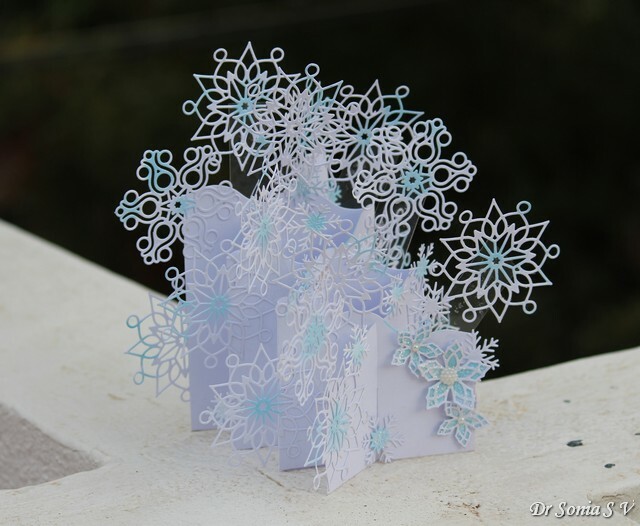 The die cut snowflakes are made to pop up and swing by mounting them on acetate sheets and attaching them to the card base Finished off the card with a trio of poinsettias! 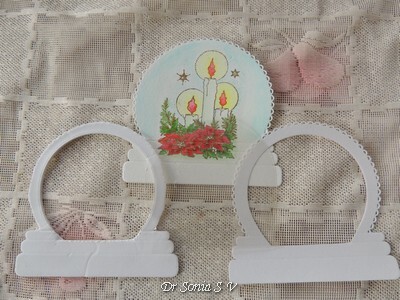 This Winter/Christmas Celebration card opens out to display and can fold flat for mailing or storage. 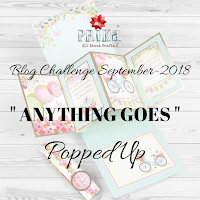 Linking to Simon Says Stamp Wednesday Challenge Pop It Up , Twisted Challenge Monochromatic, Pixie's Snippets Playground - used lots of snippets to create the snowflakes using all the scraps of white cardstock I had! 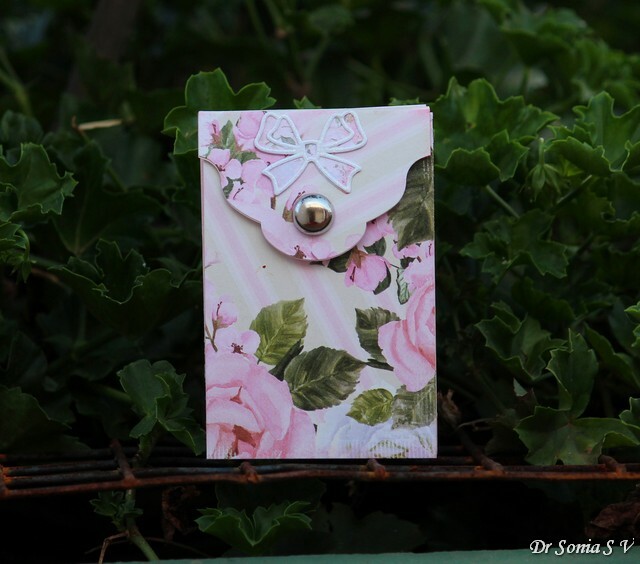 Hi friends, when I first started crafting I fell in love with Craft Punches and so I was especially thrilled when Shalini launched Craft Punches under her brand Dress My Craft ! 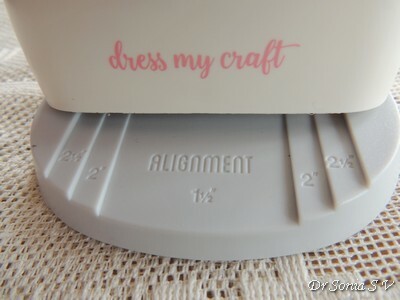 In this post I will demo the Dress My Craft Triple Punches and show you how versatile they are with a couple of projects. Size : They are pretty large and sturdy Punches and can punch paper widths of upto 2.5 inches .No limit to the length of paper you can punch! Can hold in hand and punch! Because of the levering mechanism you can hold the punch and punch with your hand instead of having to always set it on a surface to punch.This is an advantage when you want to use the negatives of the punch-outs as shown in my video. 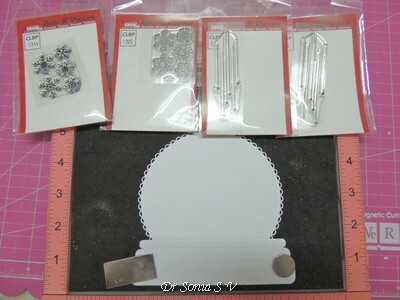 Layering Punches- The base of the 3 punches have markings of 1.5, 2 and 2.5 inches on wedges to fit papers of these 3 widths- this makes layering of your punched out tags and banners super easy. 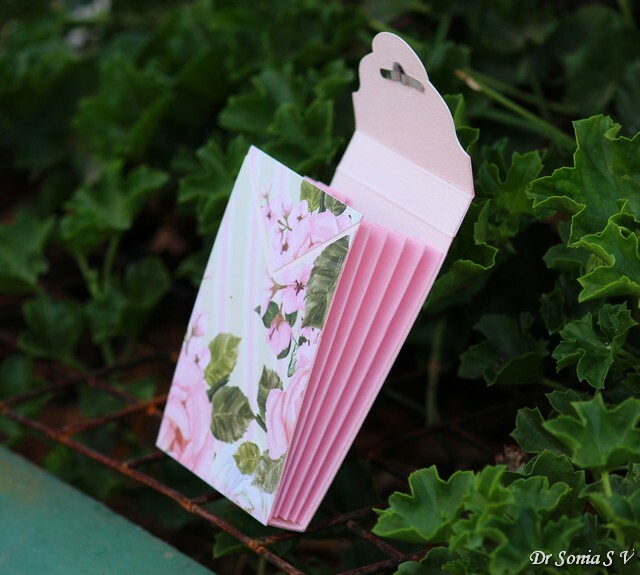 Wedged Paper feeder-The wedges on the paper feeder base are an especially useful feature as if you cut your paper to size and feed it into a wedge say 1.5 or 2 or 2.5 inches...you can easily align the edges of your paper so that you dont get a wonky or crooked tag/banner. Another advantage of the wedges is it allows you to easily align paper widths such as 1 ¾ or 2 ¼ to make layering quicker and easier. Nonskid Base : The base has built in nonskid discs which is especially handy when you are working with big punches such as these. Heavy duty Punch : The punches can easily punch papers of 300g and it even smoothly punched ivory sheets! Punches thin paper too- now you may be wondering why am I listing this as an advantage of these Dress My Craft punches...well surprisingly some heavy duty punches give jagged edges with thin paper as they are meant to be used with card-stock! Cut pieces are useful too! 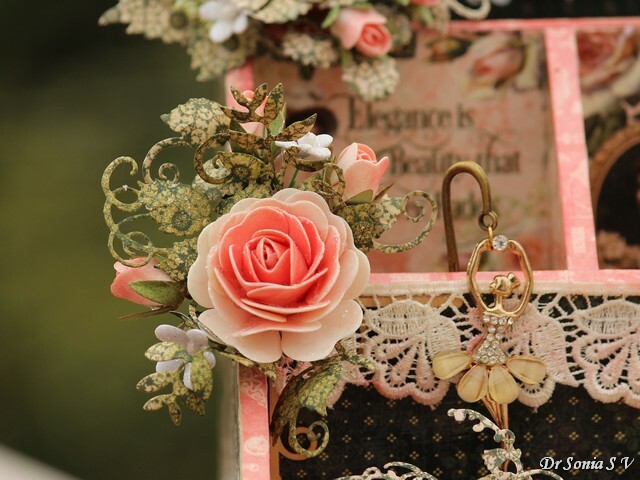 I am sure there are many of you who like to waste as little paper as is practically possible when you craft. 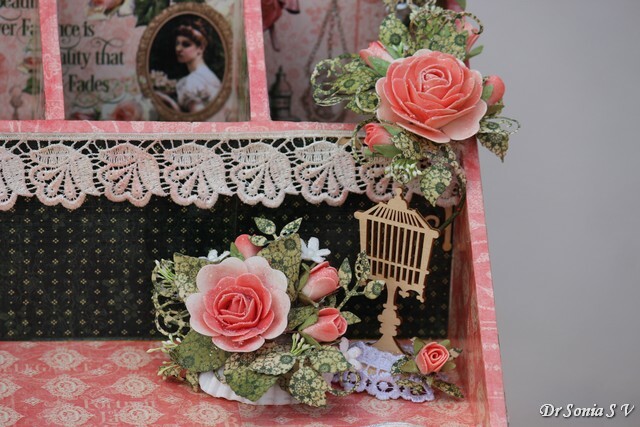 I love it when I can creatively use the negatives and little bits which are left with the main punched design . When you scroll down you'll see how easy it is to create chevrons and beautiful patterns with the negative bits of the triple punch designs! 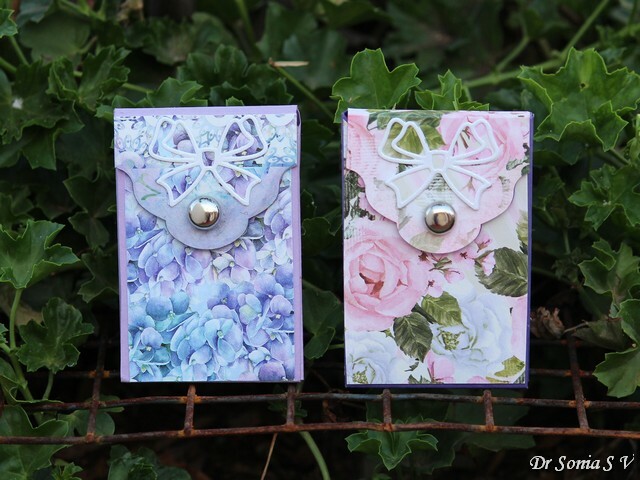 When I got the triple punches a few days back I was frantically making notepad holders as Teacher's Day gifts and these layering punches were quite handy to quickly make some gorgeous matching bookmarks for my daughter's teachers. 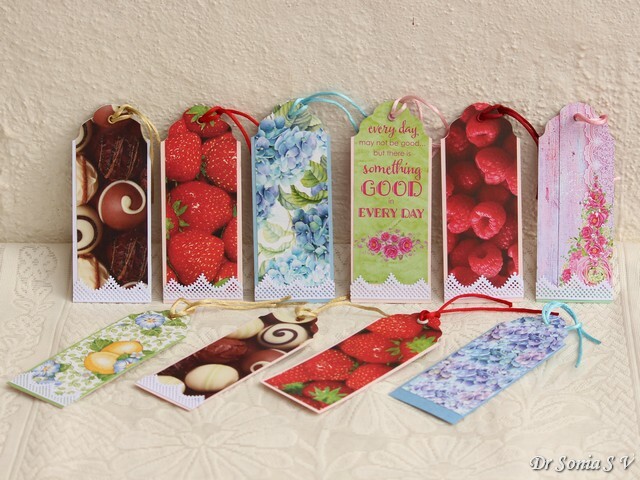 I used the Rounded Tag Punch to create the layered bookmarks. 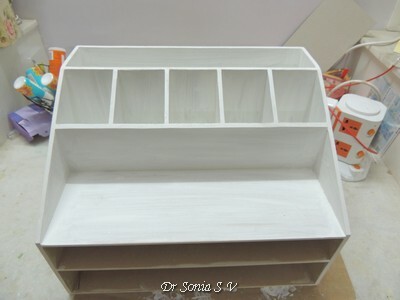 It is very easy to create layers quickly using the wedges and markings. If you are using the increments of 0.5 inches width strips....increase your paper strips by 1/4th inch only to get the perfect margin.I played around with the measurements of the strips to get borders of different widths. 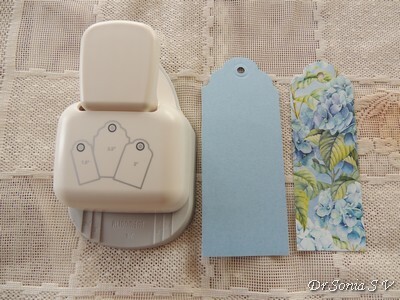 One big time saver with this tag punch is the hole which also punches perfectly with the rounded top shape. 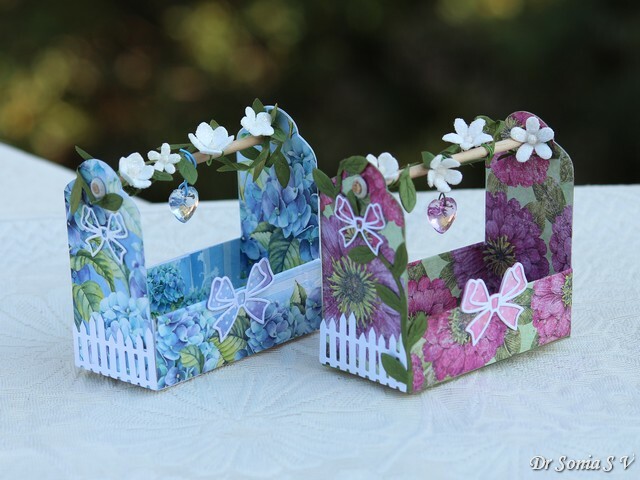 You just have to add an eyelet and a thread to finish the bookmarks!Love how the punches work beautifully with different papers. 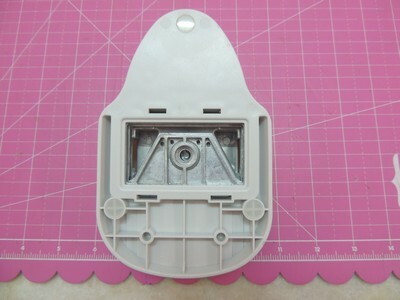 The shape of the Rounded Tag is just perfect to make a stylish closure mechanism! I created a acetate window box from this project : Foamiran Flowers Hanging Decoration and made a secure closure using the Rounded Tag punch. You just have to add an eyelet and thread a ribbon/twine to create the closure. 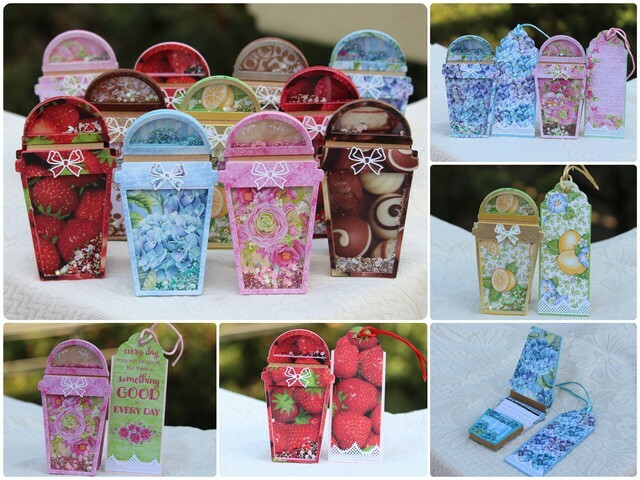 These cute Mini Flip top boxes are designed to hold ID/Business Cards. 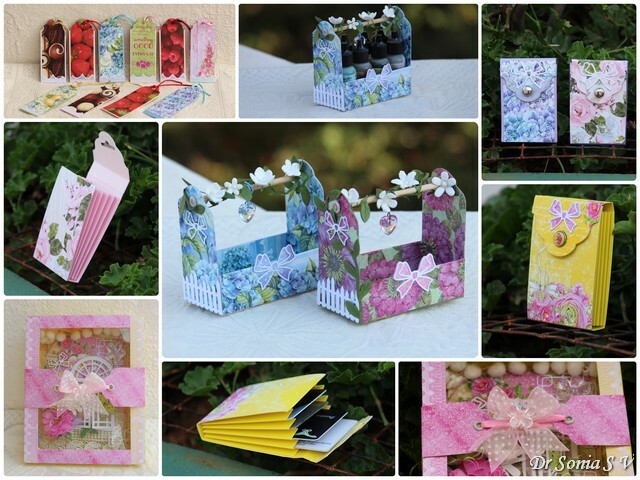 They are made from 10 ¼ x 4 inch pieces of card-stock using the rounded tag punch. 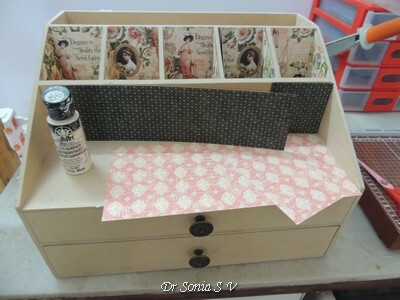 This box looks similar to the boxes shown above but is much easier to make and is quite roomier too. 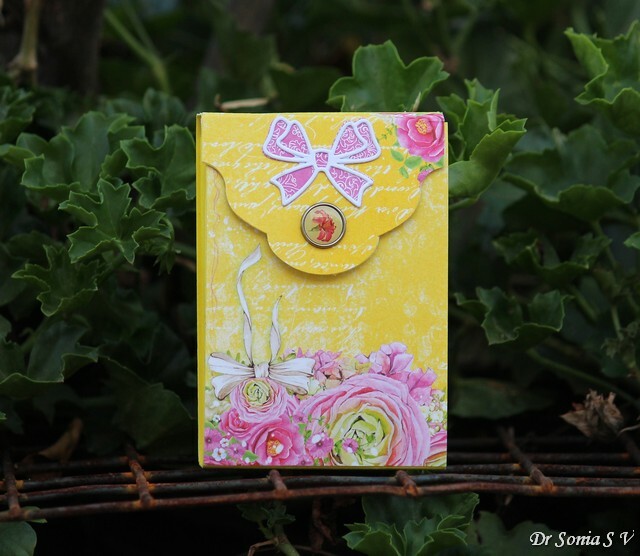 It is an accordion box which is ½ inch thick and measures 3 ¾ x 2 ½ inches .You can make it in different lengths to hold tags, I love you notes, small photographs etc. 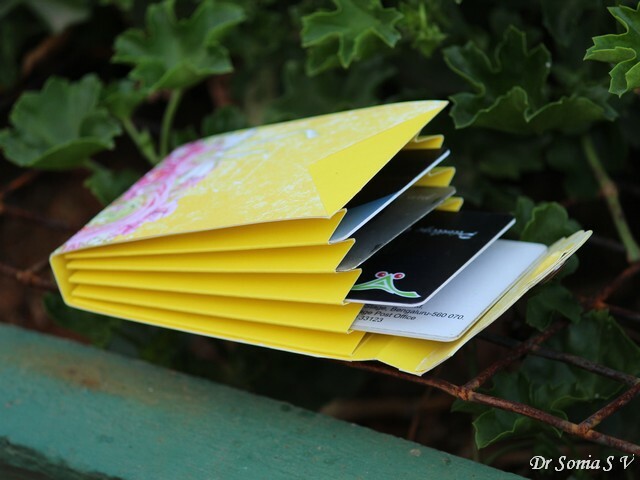 I designed them to hold Membership cards/ID cards/Visiting Cards. 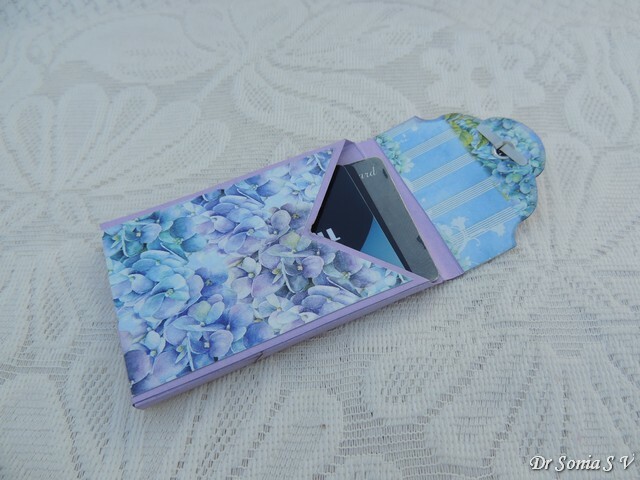 Because of the magnetic closure it is not advisable to use it with Credit Cards. And the accordions on the sides help it to expand. 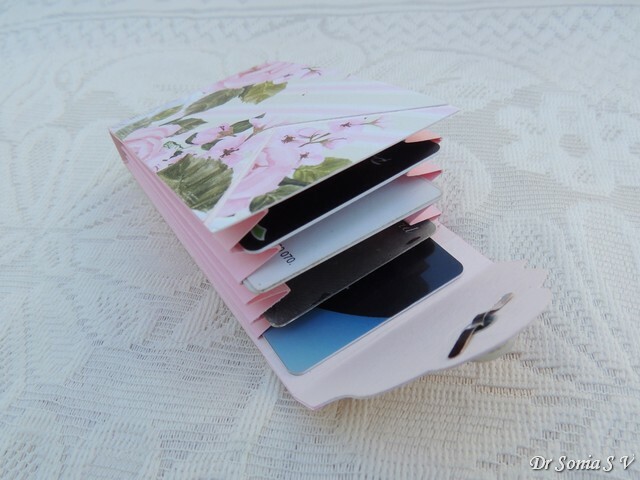 And they also help partition the inside of the holder to keep the cards separately for easy access. 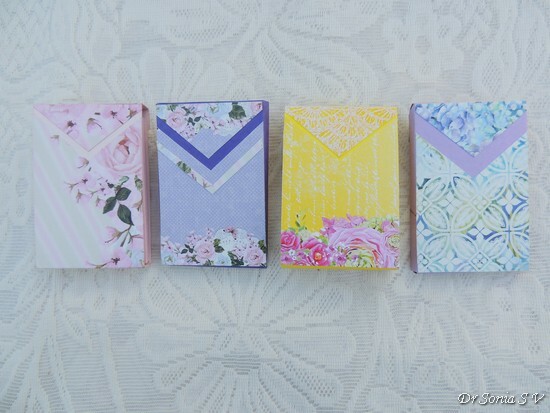 Here are the backsides of the boxes showing how you can use the negatives of the punch-outs to create chevron patterns. They would look beautiful in cards too. 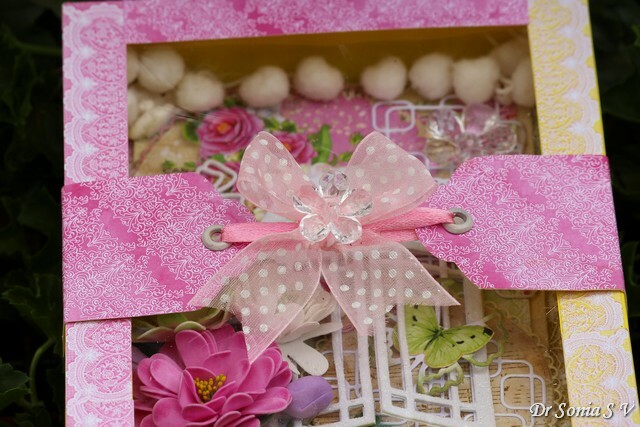 Because the Tag Punch can punch through really thick paper...it is fabulous to make Mini Organisers or Gift baskets. 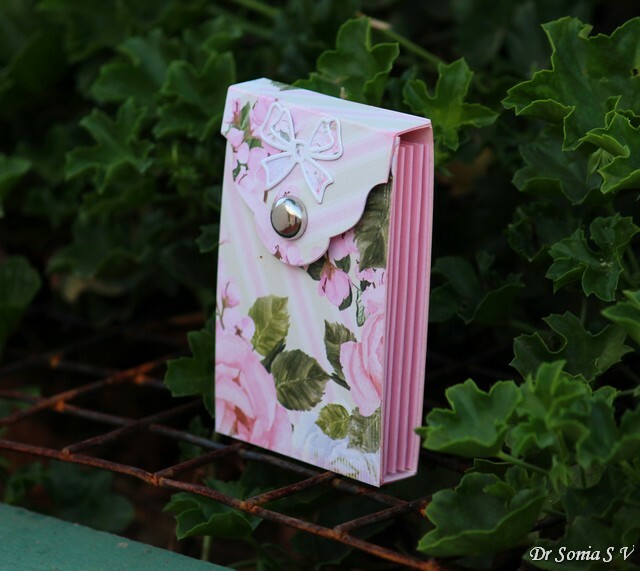 These cute Organisers have wooden dowel sticks threaded through eyelets in the tags and you can carry them around by holding the rods. You can make them as long as you want. 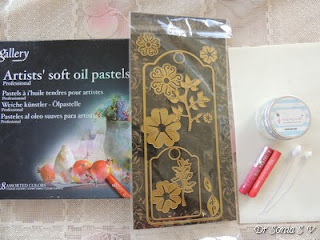 These are 4 inches long and 2 inches wide and are perfect to hold tiny bottles of nail polish [above] or crafting supplies such as Alcohol Inks [below]!